Plate with the king hunting predators. Chased and gilt silver. Iran, 7th century CE. Found as part of a treasure in the Perm Region, 1878. Acquired by the Hermitage in 1925 from the Counts Stroganov Collection. Photo by Sean Manning, September 2015. In the comments section of an earlier post I have been talking with ryddragyn about archery on the border between the Roman and Sasanid empires around the sixth and seventh centuries CE. Often we do not have sources to answer all the questions which people have today about how soldiers used their weapons, because ancient people preferred to pass that kind of knowledge on in person. But it happens that we have many kinds of evidence for archery in this period, including slightly later archery manuals, books on generalship, a wide variety of works of art, the remains of archery equipment, and odd references in histories and other kinds of literature. I would say that we have at least as good evidence for how Romans and Persians shot at each other in the age of Khosrow and Heraclius as for how Greek hoplites fought one another in Xenophon’s day. 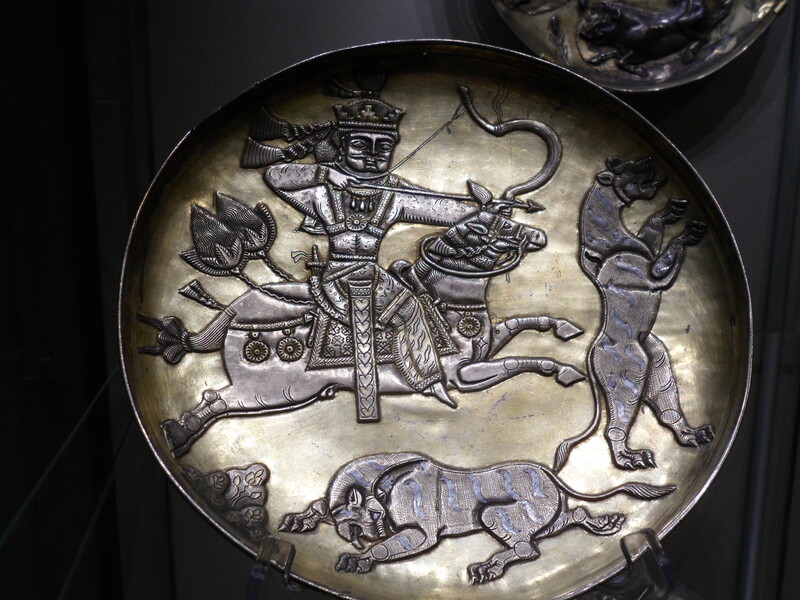 One of the most important pieces of evidence for how the Sasanid Persians drew their bows is a group of gilt silver plates and vases hammered with images of the king hunting with the bow on horseback. It happens that I was recently in St. Petersburg, and I was able to photograph many of these bowls and vases in the State Hermitage Museum. This week I thought I would post some of my photos. Because I have not shot a bow for too many years, nor read up on this period of history, I won’t try to provide a commentary. The captions for each photo are based on the English labels in the Hermitage.